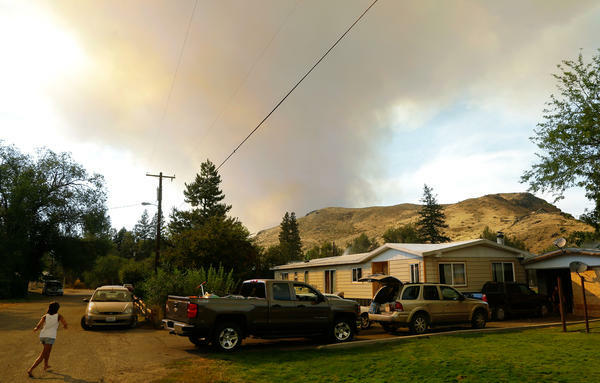 Smoke rises from a wildfire approaching Twisp, Wash., on Aug. 19. Smoke can damage the health of people hundreds of miles downwind. A screenshot of fire conditions on AirNow.gov, with orange icons showing fires and gray representing smoke. I stepped out my parents' front door last Thursday, expecting a typically glorious summer day in southern Oregon. Instead, I was hit with acrid wood smoke that stung my eyes and throat. The air was thick with haze that obscured the mountains. I quickly retreated inside. 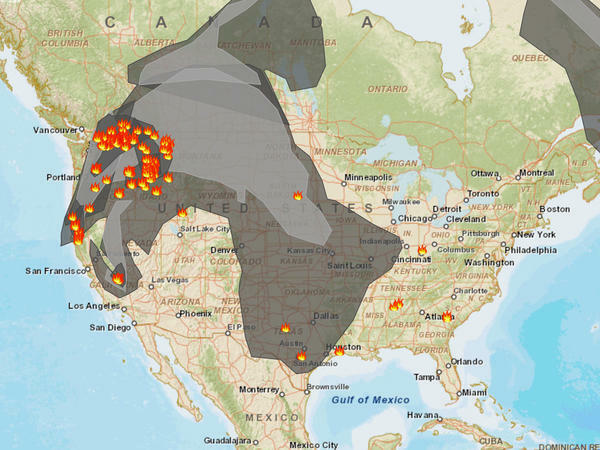 Health departments across the West are mobilizing to protect residents from smoke generated by dozens of fires that have sent smoke as far east as the Midwest. "It's really bad," says Janice Nolan, assistant vice president for national policy at the American Lung Association. "I hadn't seen 'code maroon' days, which is the most hazardous air quality, in years." Lewiston, Idaho, is stewing under "very unhealthy" smoke, with older people, people with heart and lung disease and children urged to "avoid all physical activity outdoors." And it's hardly the only city affected. Last weekend, Portland, Ore., which typically enjoys crystalline summer skies, was swathed in unhealthy levels of smoke that resembled wintry fog. It had drifted in from fires in Washington state. "Unfortunately, this may be the new normal for us," says Jim Vannoy, program manager for environmental health programs at the Idaho Division of Public Health. "Not just for a day or two, but for weeks on end." An extended drought and climate change mean more fires that burn longer, Vannoy says. The public health department is trying to get the word out through the state's smoke blog and social media, so people can learn how to protect themselves. For schools, that means indoor recess and no outdoor sports practice when air quality levels are unhealthy, according to an advisory the public health department sent to Idaho schools. Tiny particulates in smoke travel deep into the lungs, where they evade the body's defense systems, Nolen says. That poses an especially big threat to people with asthma, cardiovascular disease or lung diseases. Children are susceptible even if they're healthy, she says, because their lungs are still developing. Staying inside is the best defense, Nolen says, with air conditioning set to recirculate air. Check the local air quality index before heading out. "If it's anything above a code green, people will be affected." Face masks don't help, according to both Nolen and Vannoy. Lightweight masks used to fend off germs don't keep out fine particulates, and N95 masks that do are uncomfortable to wear all day. "We really hesitate to recommend face masks," Vannoy says. "We really want people to stay indoors." The state may also consider establishing clean air shelters where people can get away from the smoke, he says. If there's any silver lining, it's Vannoy's final recommendation: "We recommend not vacuuming." Most home vacuums don't have HEPA filters that catch tiny particles, he says. So if you're smoke afflicted, ditch the vac for the sake of public health.